Arts+Leisure is thrilled to announce There Is Another Sky, an exhibition of recent paintings by Emilia Olsen. Depicting voluptuous female figures in a range of settings, particularly coils of snakes and verdant layers of plants and flowers, Olsen’s work presents a tour-de-force of expressive technique and painterly flourish. Rendered in viscous swaths of oil paint manipulated with a variety of mediums, her fleshy figures are both organic yet aggressively assertive of their materiality. In Flowers for Myself and Marigolds, Olsen pushes the dynamics of her practice to its limits, crafting sculptural, three-dimensional forms from globs of impasto paint; hovering between painting and sculpture, they confront our understanding of the interplay of simulation and simulacra in the image. Sheathed beneath a lattice of flowers, the female figures in Field Day and Sorrow Is Not My Name (After Ross Gay) project a sense of reverence and tranquility, a sort of eternal quietude. Recalling Ana Mendieta’s seminal Siluetas series of photographs and performances, Olsen’s figures appear to sink gently into the earth, intimately in tune with nature’s pulse. Though the corpse-like placement of the bodies in these canvases immediately evokes death, Olsen renders them in a state of sublime peace, implying instead a serene return to natural cycles of life and death. Lady of the Dunes captures a figure in a moment of quiet repose, reclining amidst a lush sea of shrubs and leaves. In Marigolds, Olsen again juxtaposes floral motifs with allusions to death, portraying a skull flanked by the eponymous marigolds; however, the skull is grinning, and its form is reminiscent of the sugar skulls used in Mexican Day of the Dead celebrations, highlighting the universal, inevitable nature of death. In Medusa and The Gorgon, Olsen probes the symbol of the snake, particularly its association with women. Referencing the demonic female goddesses of Greek mythology, in the former she replaces the figure’s head with a writhing nest of snakes; interestingly, the figure’s back is turned to the viewer, thus negating Medusa’s supposed ability to turn those who gaze at her face into stone. The composition of The Gorgon is quite similar to Olsen’s paintings of female figures beneath layers flowers, though here they are replaced with sensuously curved, interweaved snakes. 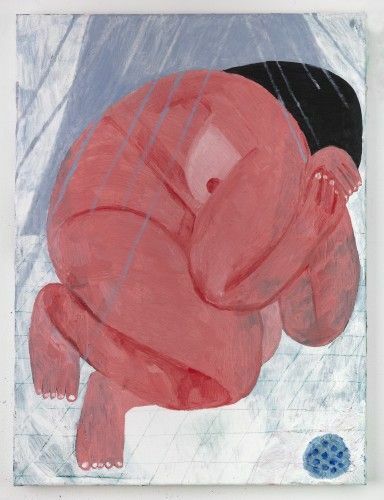 Adopting a domestic setting, End of Day captures a moment of supreme vulnerability and helplessness; curled in the fetal position on the floor of a shower, the female subject appears overwhelmed and immobile, a far cry from Olsen’s floral pieces. Similarly, in Mornings and Night Stretch, the artist explores the potential of the body as a site for physical manifestations of emotion, tucking psychological tones of depression and apathy within the creases of skin.